A couple took their love "to infinity and beyond" when they tied the knot in Chicago this summer. Garrett Smith proposed to his boyfriend, Jason Bitner, at Disneyland about two years ago, and they decided to replicate the "happiest place on Earth" on their wedding day. 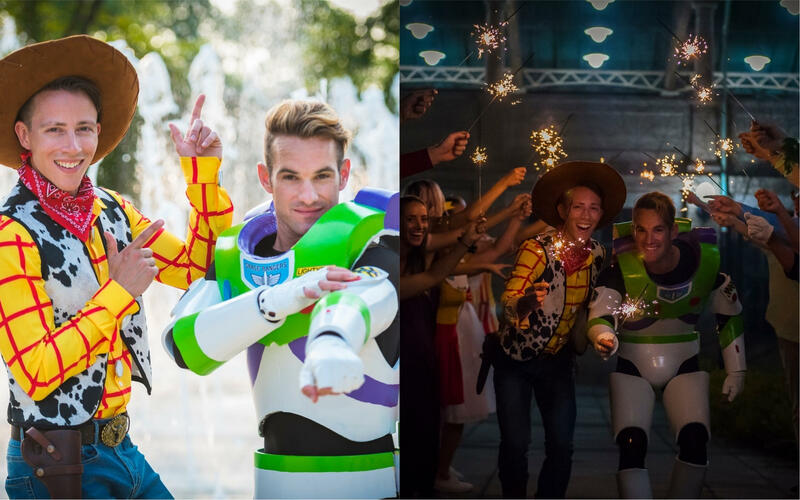 Dressed as Buzz Lightyear and Woody from "Toy Story," the grooms held a magical wedding fit for two princes — and tons of other Disney characters showed up, too. "I think we both liked Disney growing up, probably as much as any kid did ... We both had the VHS tapes that wore out until the plastic was broken," Bitner told CBS News. The couple says their love for Disney was reignited when they first took a trip to Disneyland together in April 2013. They went back to Disneyland five or six times, and to Disney World at least twice, and there was no denying they both loved it. When it came to planning their wedding, they considered getting married on the beach, Smith said. "But we also love costumes, so we said, 'Let's just do both of them. This is our day so we can do whatever we want.'" The they chose to the closest thing you can get to a castle on the beach in Chicago, and encouraged all of their guests to dress for the theme: Disney characters. "My mom very quickly said, 'I wanted to be Ursula,'" Smith said. "So that sort of helped my dad's costume at least." His dad stuck with the "Little Mermaid" theme and dressed like King Triton — beard, muscles, tail and all. "For my parents, every year they do a pirate cruise on their boat, so they have very good Jack Sparrow and pirate costumes," Bitner said. "My dad loves that costume so much, he had to do it," he said, referring to his dad's "Pirates of the Caribbean" outfit. His mom dressed like Tinkerbell from another pirate-laden Disney classic, "Peter Pan." Almost all of their other guests came in Disney costumes as well. Among the best dressed were Mary Poppins and Bert, and Flynn Rider and Rapunzel, who wore a four-foot-long blonde wig. "The wig didn't last all night," Smith joked. Their wedding photographer, Tiffany Brandt, captured Stitch, Snow White, The Incredibles, Nemo and a couple of Prince Charmings, all mingling together at the reception. The theme did not stop with the costumes. The couple also decorated each of the 15 tables based on different Disney movies, from classics like "The Lion King" to new favorites like "Moana." "We didn't have a wedding planner, so we made all the centerpieces ourselves," Smith said. The groom also made his own Buzz Lightyear costume. For three months, he watched tutorials online and slaved over the foam armor, but it was well worth it. The end result looks like an exact replica Buzz's suit. The couple didn't wear their Buzz and Woody outfits to the ceremony itself, opting for brightly colored suits to go with the magical theme. "Garrett's grandma tailored a white suit jacket to look more like Buzz," Bitner said. When it was time for the reception, the grooms changed into their "Toy Story" costumes and made a grand entrance as the newly-married Buzz and Woody. The couple said it was a no-brainer for them to dress like these two characters. "I knew I wanted to have my first dance be 'You've Got a Friend In Me' for quite a long time, before Jason and I even got engaged," Smith said. "So it just happened that this worked for that song ... It was a natural fit." And as if the Disney-filled day wasn't enough, the newlyweds also made a Disney stop while on their honeymoon. The couple said they vacationed in Hawaii, but had a layover in California on the way back to Chicago. So, the natural thing to do was to go to Anaheim and visit Disneyland. Just like in "Toy Story," Smith and Bitner told each other "you've got a friend in me," and they made a vow to live happily ever after.